Home PRIMAVERA P6 What is Primavera P6 ? How to Use Primavera P6 ? What is Primavera P6 ? – In today’s challenging business environment the number of large and sophisticated projects are increasing. The main problem is most of the projects are out of control and many project managers can not plan, manage and track their complex projects effectively. Many professional in the project management field have general information about the planning and scheduling softwares. Especially project managers, planning engineers and schedulers are using some of them to keep their projects on track. Softwares like Primavera P6 and Microsoft Project support planning, scheduling, managing and decision making processes within the project to ensure the project stays on track. Beginners in the project management field always try to understand the main functions of P6 and other similar softwares. What is Primavera P6 ? Oracle Primavera P6 is one of the most useful and effective project management software available on the market. It is designed to plan and manage all kinds of complex projects with satisfying each team members requirements. This software provides all necessary tools and features which helps to manage your projects entire life cycle. Risk management, critical path analysis, resource and cost management are some of the basic features of this software. By the help of it, organizations can successfully manage their projects in today’s uncertain economical conditions. Basically there are two versions of P6: Primavera Professional Project (PPM) Management and Primavera Enterprise Project Portfolio Management (EPPM). Although both versions serve the same project management purposes, there are some differences between them. Let’s take a look at both version of P6. What is Primavera P6 EPPM ? It is a good idea to understand the difference between P6 PPM and P6 EPPM before to purchase one of them. Both of them are suitable for large and complex projects. However, P6 PPM is a windows based software which connects to a server-based or a local database. Although, many organizations prefer to use P6 PPM as a standalone software, it can be used either as a standalone tool or an enterprise tool. P6 EPPM includes many useful features that P6 PPM does not have. One of them is the Methodology Management tool which involves project templates for different kinds of projects. As of version 8, Methodology Management is removed from P6 PPM and it is now available only in P6 EPPM. Another important difference is that processing speed of P6 PPM is more than Primavera P6 EPPM. Because it is a standalone software and this ability enables to make changes faster. On the other hand P6 EPPM requires a high quality internet connection and if your connection speed is low, you can not use the software efficiently. Reporting feature of P6 EPPM is more advanced than P6 PPM. You can create more visual reports, graphs, tables in P6 EPPM. This is useful for demonstrating the project status at any level from executive level to low levels. 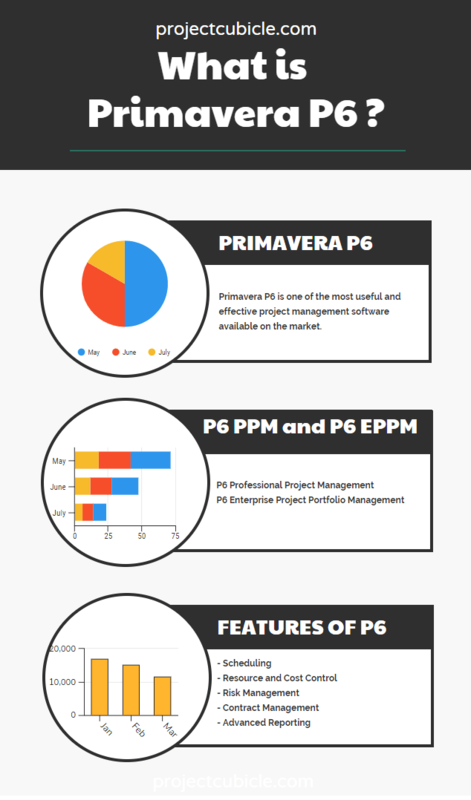 Primavera P6 provides high level project management solutions for your business. Many people think that Primavera P6 is created only for scheduling purposes. It is not just a tool for creating Gantt Charts. It provides many solutions such as cost management, earned value management, risk management, resource management, contract management and reporting. Let’s take a glance at some of the basic features of Primavera P6. • Scheduling: Primavera P6 involves advanced scheduling solutions. Activities can be created under WBS (Work Breakdown Structure) levels, relationships can be established between the activities and the critical path of the schedule can be calculated by the help of scheduling feature. • Resource and Cost Control Management: Resources, unit prices and expenses can be assigned to activities. Project budget can be tracked with the help of this feature. Project teams can easily compare the planned and the actual status of costs and analyze the performance of project. • Risk Management: It is possible to identify and prioritize risks by the help of this feature. Risks can be assigned to activities and risk analysis can be performed for each activitiy and project. • Contract Management: Primavera P6 contract management feature provides advanced document control solutions. It is possible to track Requests For Informations (RFI’s), changes, issues, submittal and approvals and their impact on the schedule with this feature. • Reporting: Primavera P6 has advanced reporting feature that allows to use the reports existing in the database or create custom reports for special needs. What are the benefits of Primavera P6 ? Project teams use softwares to monitor and control their project’s performance. It is difficult to complete a project on time and on budget without the help of project management softwares. Because today’s projects involve thousands of activities and variables that must be controlled effectively. An unexpected problem or delay in the critical path may cause overall project delay. Like other softwares (Microsoft Project) , Oracle Primavera P6 helps to keep the projects on track. Oracle Primavera P6 is one of the most popular software used for effective project management. Project managers, project coordinators, project planners, schedulers, planning engineers and stakeholders from various industries have been using Primavera P6 for many years.